The New England Patriots are in Buffalo as they will be on Monday Night Football against the Bills. With Miami and the Jets both losing this week, the first thing that jumps out for the team is a chance to move farther ahead in the division. With a win over Buffalo tonight, the Patriots will be two games up on Miami with a tie-breaker in hand, three games up the Jets and four ahead of the Bills. But the team also wants to continue their winning streak, since the poor 1-2 start, they’ve won four in a row and yet the feeling is, that this team still hasn’t played its best football yet. With the trade deadline just around the corner, the team playing tonight may look a little bit different on a short week, when they face off next against Green Bay in yet another primetime game next Sunday night. The Patriots big tight end has returned to practice this week, and a good sign was that he took part in the pressers on Friday where he seemed upbeat and ready to go after missing last week’s game with ankle and back woes. Having Gronkowski back in the lineup would be great news for the Patriots offense and bad news for a tough Buffalo defense. Gronkowski, a Buffalo native, has loved playing against and torturing his hometown team. 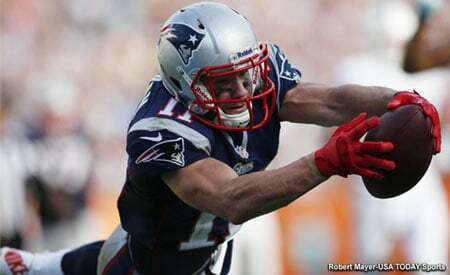 In 13 career games against the Bills, Gronk has 66 catches for 1027 yards and 12 touchdowns. The big man is a force multiplier for the Patriots offense, with him on the field, opponents have to focus on stopping him and it allows for other receivers to get free and face single coverage, where he’s frequently doubled. The Patriots best player, arguably on their defense has been playing well but hasn’t had the kind of production we’d expect from him, having just a pair of sacks thru the first seven games which has been an issue for the Patriots as a whole. The last few games, they’ve had better overall QB pressure, but haven’t got home enough to get some sacks. That may change this week. The Bills offensive line has done a generally poor job of protecting their quarterbacks, starting with Nathan Peterman, the rookie Josh Allen and now Derek Anderson. They’ve allowed 26 sacks on the season, allowing nearly four a game. Flowers and the other players on the edge have a chance to not only increase their own stats a bit but to influence the game this week. With a Patriots offense that has been scoring around 38 points a game for the past several weeks, the Bills offense may be forced to throw more than they’d like and get away from their running game. It is up to Flowers et al to make that part of the game a win for the Patriots. Flowers will be going up against Jordan Mills the RT for Buffalo. And it is a matchup we’ll be watching closely. The Patriots quarterback has had tremendous success against the Bills going 28-3 in his career. After a slow start for the offense this season, getting Julian Edelman back and then adding Josh Gordon has been a huge boost for Brady as the unit seems to be just hitting its peak. The Bills defense is very tough and they have good pass rushers in Jerry Hughes and their old reliable, Kyle Williams, who it seems always plays well against the Patriots. Their secondary is good allowing just 210 yards per game. In fact, the Bills haven’t allowed a 300-yard passer in 15 straight games going back to last season. We’re looking for Brady to mix things up and spreading the ball around this week. His wins against the Bills are the most any QB has had against one opponent. We see another big game for #12 this week under the bright lights of a national game. The Patriots corner has been quietly having a Pro-Bowl type of season in 2018. Gilmore started the year off right, he’s been outstanding since the OTAs and mini-camps thru the spring and right on thru the summer and into the first seven games. Now he’s facing his old team and the Bills will be trying to get their passing game going with Kelvin Benjamin and Zay Jones on the outside. Gilmore signed a big money deal with the Patriots last year, (and their move was justified, despite the early questions) and the quiet man from South Carolina, doesn’t do much talking but would love to shut down the Bills passing game tonight. Gilmore has been shutting down opposing wide receivers pretty well all season, and although teams are throwing away from him, he came close to getting a pick last week against Chicago, we’ll go out on a limb a bit and say this is the week, he gets one against his former team. The Patriots designated pass receiver out of the backfield has been tremendous this season and is on pace for more than 100 receptions in 2018. White has always been Mr. Reliable and he continues to be a big part of the Patriots offense. With Sony Michel out for at least this week with a knee injury, that leaves the Patriots with just two healthy running backs, White and Kenjon Barner on the roster. While they may activate Farrow from the practice squad, they may just opt to go with the two along with James Develin at fullback this week. This means that even more onus will be placed on White as he’ll have to carry a much larger percentage of the running game with Michel out as well as his passing game responsibilities. White has a knack for finding the open spots and consistently moving the sticks. We should see a lot of him tonight. 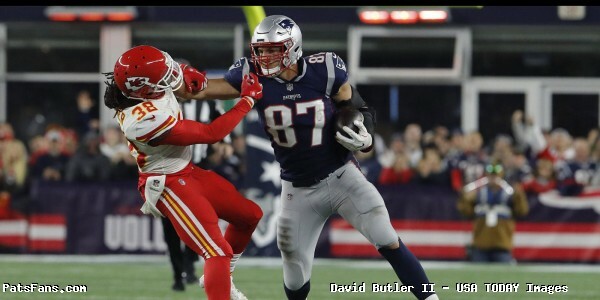 This entry was posted in 2018 Patriots Regular Season, NFL Commentary, NFL News, Patriots Commentary, Patriots Film Room, Patriots News and tagged 2018 NFL Season, 2018 Patriots season, Bill Belichick, Buffalo Bills, Chris Hogan, Dont'a Hightower, James White, Julian Edelman, New England Patriots, NFL, Patriots, Patriots edge rushers, Rob Gronkowski, Stephon Gilmore, Tom Brady, Trey Flowers on October 29, 2018 by Steve Balestrieri.